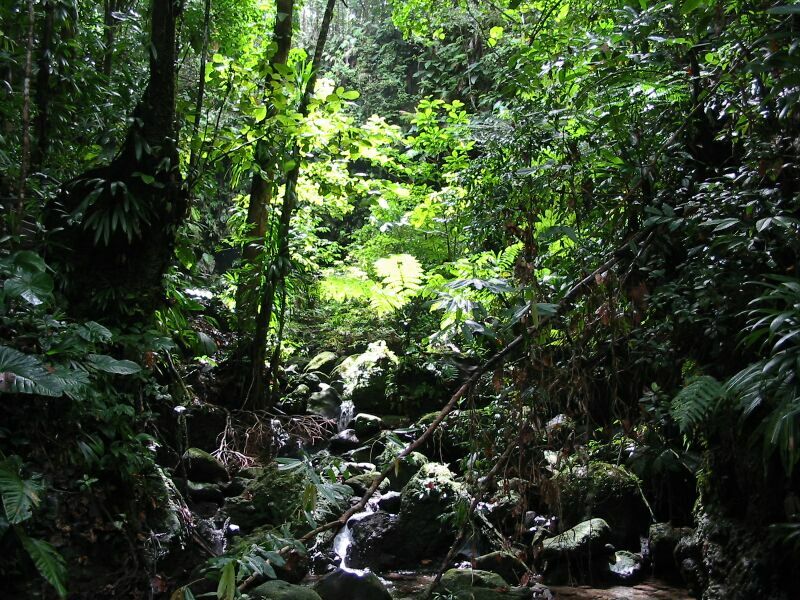 Dominica is an independent island of the British West Indies. 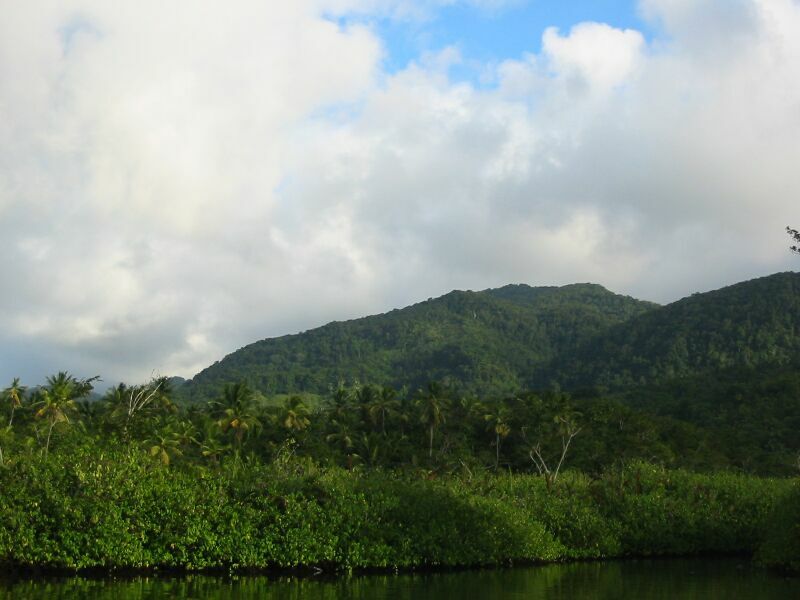 They have a beautiful island with very moutainous terrain, covered with tropical forest, 100s of rivers, and is the home to what is left of the Carib indians - the natives of many of the Caribbean islands when Columbus arrived. Like in America, the Carib indians all over the Caribbean were forced to a "reservation" and this is located on the eastern-middle part of Dominica. Unlike the American Indians, the Caribs at least have land where they can grown almost any kind of agriculture and largely supply food for themselves. 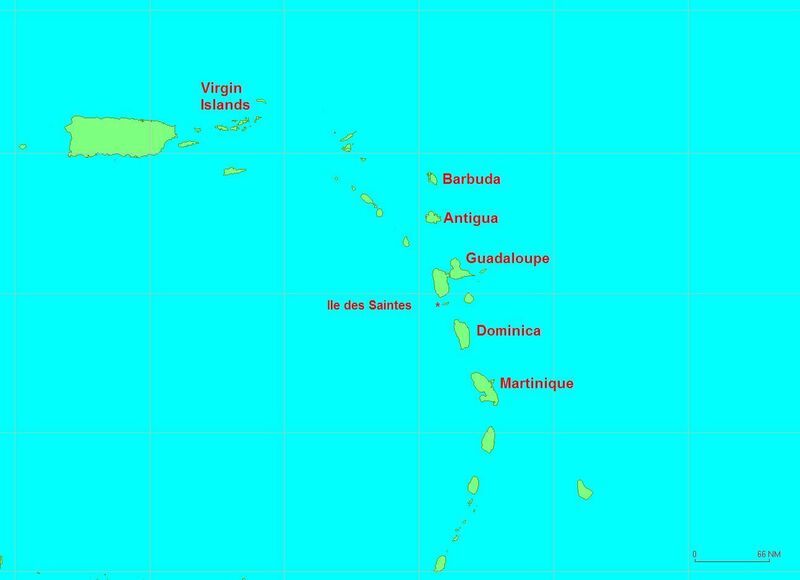 PatiCat left Basseterre, Guadaloupe at 2:30 PM on February 10th. 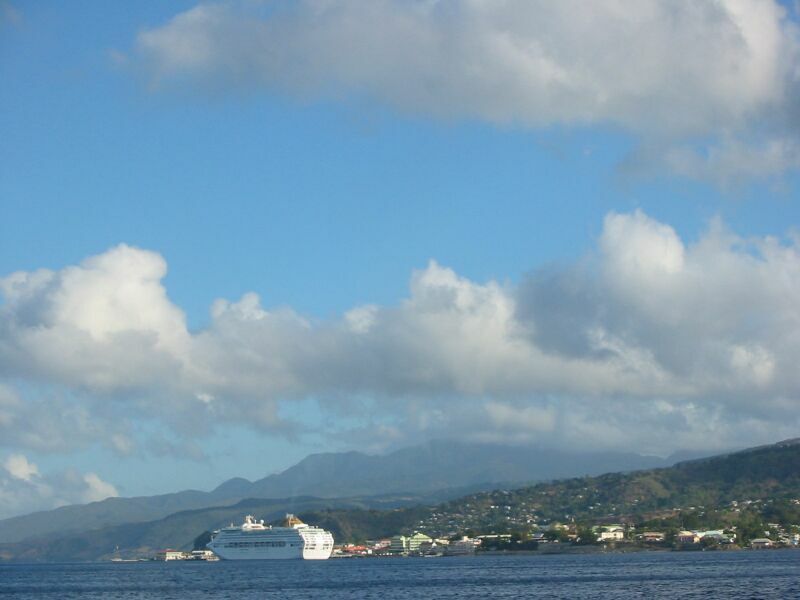 We knew we would not arrive before dark into Portsmouth - the northern port of entry of Dominica. But, the port is a wide bay with deep waters until you get to shore. So, we weren't concerned with a nighttime arrival. We passed the Saintes on the way down, and the winds were a bit breezy which gave us some 7-8 foot waves along the way. But, not too much of a problem for PatiCat, and at least we sailed along at a pretty good speed of 8-9 knots. 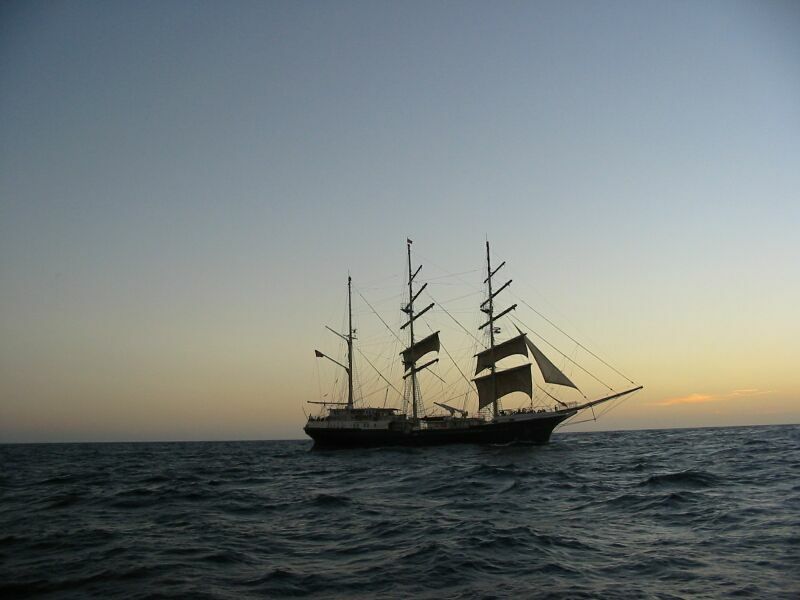 We arrived at Portsmouth at about 6:45 PM with a 1/4 moon, so we had no problem finding an empty area in the bay and dropping our anchor. We settled down for bed shortly after. The next day, not long after we had breakfast, a boat boy (that's the official term down here) - a young man named Alexis - approached us and proffered his official River Guide Association id card. He offered to help us in any way during our stay including a river tour, taxiing around the bay, a taxi tour of the island, ice, etc. - anything at all. We were busy with homeschooling, so we asked him to come back later. Which he did - twice. Judging from the dozen or so other boat boys we saw approaching other sailing vessels in the bay, we could see the competition was stiff. A short while later, Frank went ashore to enter customs. It was immediately apparent that the standard of living here is much lower than most of the bigger islands we have visited. This was even more apparent later. Frank eventually found the customs office hidden behind some run-down warehouses which are still used for selling and storing bananas - the main export of Dominica. 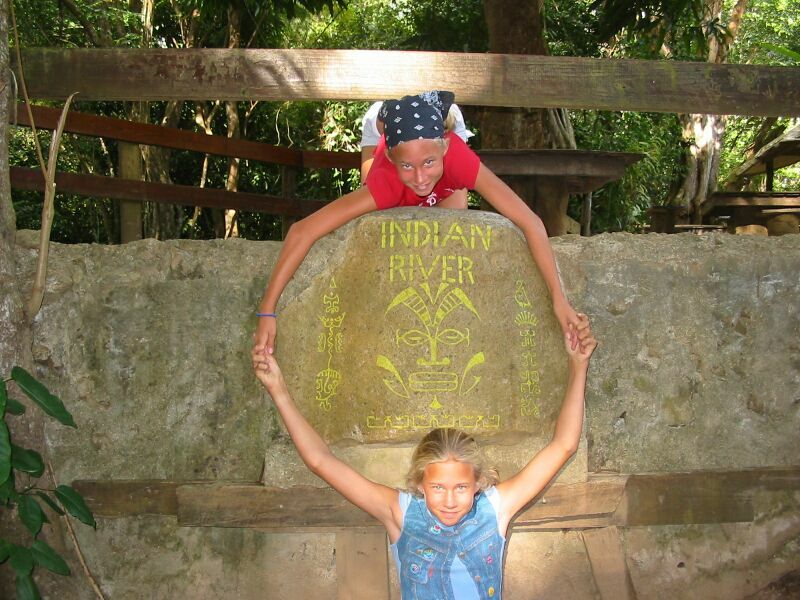 We made arrangements, and later that day did the Indian River tour. This river is in a national park which protects the river's beautiful natural resources and wildlife. The river guides are not allowed to use motors, and row their customers up the river. 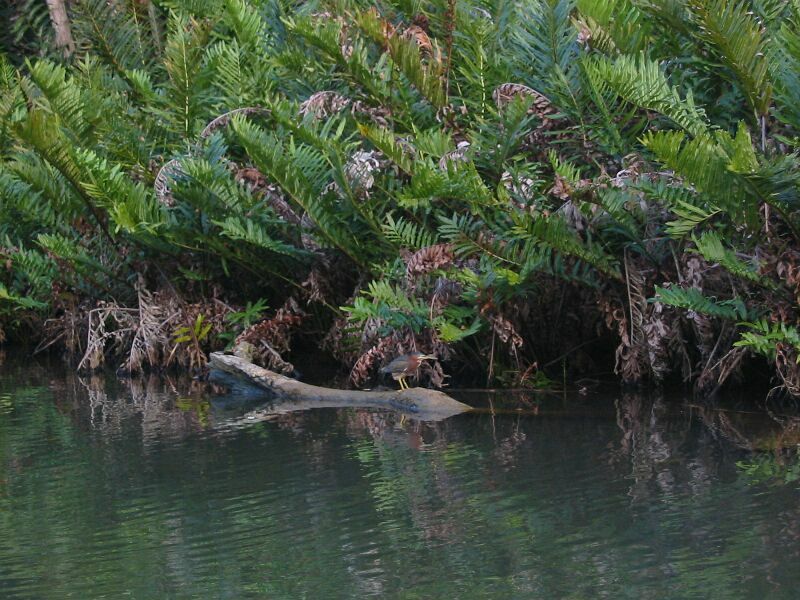 The river is surrounded by tropical forest, and is abundant in wildlife. We saw green-backed heron, crane, a variety of fish (both salt and fresh water), crabs, kingfisher birds, and then a huge variety of vegetation. At the end of the river tour - about a mile up - is a home-built open-air bar surrounded by a beautifully landscaped garden area. The bar apparently was present before the national park and is the only aspect of commercialism on the river. Our guide found some palm leaves and carved and weaved the girls some bird figures. He also found and opened a coconut for the girls. Here are some pictures from the river - which was certainly pictueresque - included are a picture of the sign, the entrance of the river with other boats, a shot of a green-backed heron on a branch, a shot showing the beauty of the tropical forest enshrouded mountain backdrop, and a shot of Alexis making a bird figure. We enjoyed the river tour, and made arrangements to do a taxi tour of the island through our guide the next day. 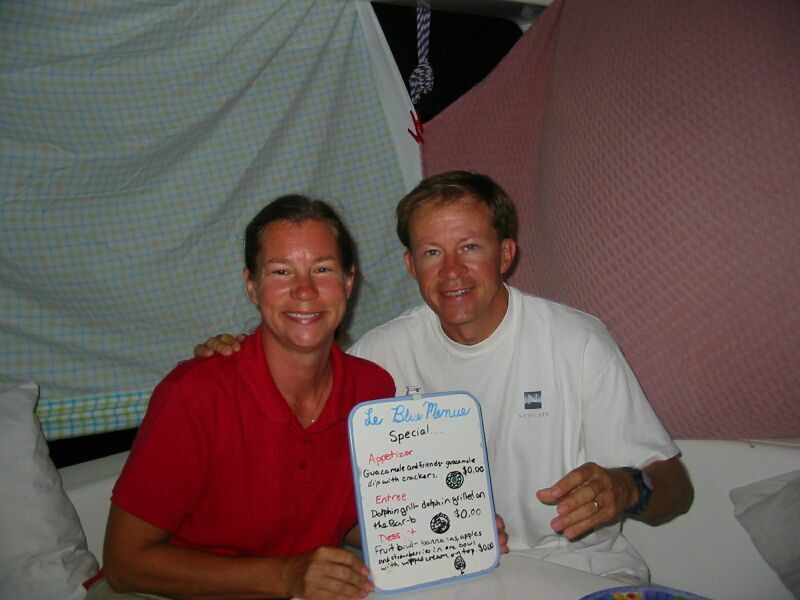 That night, we locked up the boat, including the hatches as it was raining, before going to bed. Around 1:00 AM, Frank woke up - as he often does to check on things with the boat - this time he had heard an unsual noise - probably the anchor bridle he thought. As he walked quietly - so as not to wake up Karen - up to the salon, he saw a figure silouhetted through the salon windows outside near the mast! A burgler! We had read in our cruising guide that this port had a cat burgler who tries to sneak on boats in the night and steal wallets from your bedside. Frank went up to the window and tapped it - startling the burgler. Then Frank opened the back door and ran up to the deck - the burgler quickly dropped to the deck, crawled under the lifelines and let himself in the water quietly. Frank told him to "Move it!" when he didn't move fast enough. Frank even debated grabbing him, but later found out the burglar usually oils himself to avoid capture. The guy had no boat, so he must have swam out to the boat. Frank didn't want to wake the family and scare them, and he was too mad to go back to sleep. He also was concerned another boat might be visited by the burgler. Frank shined a spotlight on the other nearby boats several times, but saw no sign of the burgler. About 90 minutes later, Frank heard a woman scream. He looked out, and a boat about 200 yards away had their lights on and were running around with a flashlight looking around the boat. Frank knew what had happened. The next morning, Frank watched his neighbors for signs they were awakening. They were moving around at about the same time as Alexis came to get us. Frank took the dinghy out and met Alexis on the way in, and told him about our visitor. He told Frank that they already had "several" burglers in jail. So, they had another one. Sheesh! Frank went to the boat where the screaming had occurred. He asked what had happened and told them about our visitor. The couple, who are from New Zealand, were very glad to hear this as they weren't sure if they dreamed their encounter. The woman had awakened and moved towards the cockpit to investigate a noise, and the burglar was right in the cockpit, so she screamed. But, they never heard him splash when he went off the boat, so they thought they had imagined it. They agreed to report the incidents to the police - as we were going on our taxi tour. But, the police weren't very helpful. 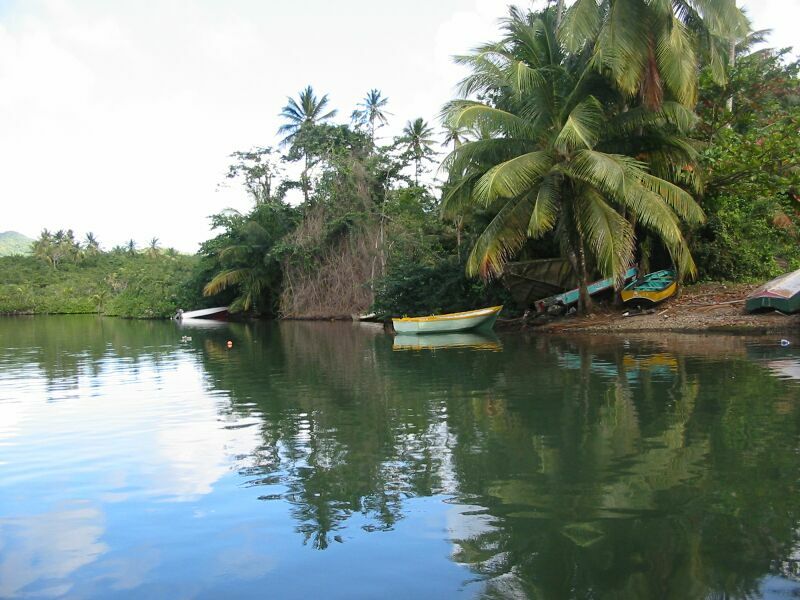 On our taxi tour, the low standard of living of Portsmouth, and the entire island of Dominica, made it plain to us why some people might resort to crime on visiting boats whose standards of living are so much higher. But, it also will end up hurting their economy even more as fewer boats will risk visiting. Alexis took us ashore and introduced us to his friend Tony who would be our "taxi driver". Our "taxi" was a beat-up old Nissan sedan, with no official markings, and it was clear Tony was not an official driver. But, Tony was a safe driver - and was fairly informative, bright, and entertaining. He always beeped and slowed around the many curves through the mountain roads, and only sped up on the few straightaways - where he usually managed to reach the limit of the old car's speed (probably around 85 mph). We soon learned Tony wouldn't stop for any of the scenic spots unless we asked him to stop. He did stop at nearly any roadside "shop" or table of tourist goods - usually handicraft (baskets and woodcarvings) or local fruits and vegetables. After everyone had bought something we told him he didn't need to stop any more. Along the way, in addition to the abundance of beautifully scenic tropical forest enshrouded mountains and rivers, and gorgeous volcanic rock atlantic beaches, Tony showed us many things. Everywhere there were banana and plantain (similar to bananas) plantations. A banana tree only grows one bunch of bananas, then has to be cut down. Nearly every tree had its bunch of bananas enshrouded in a blue plastic covering. This was to protect from insects, enhance ripening, and to protect the bananas from casual thieves. 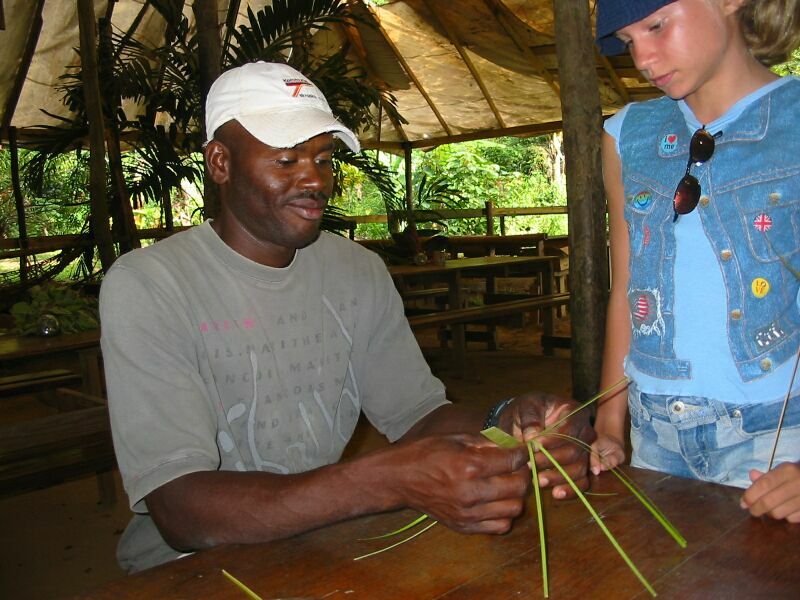 Tony showed us many other forms of vegetation including: mango trees, breadfruit trees, grapefruit trees, avocados, pineapple, and dozens of kinds of flowers. He showed us a coconut processing plant as well. As we went through the mountain roads, and drove through the small towns and villages, the state of poverty was disturbing. As with other poverty we've seen in the behind the tourist towns on the islands, our appreciation of American society has been forever changed. We eventually started driving through the Carib territory. The Caribs have a very occidental appearance to their faces. We heard a story about a Japanese tourist who walked up and started talking to a Carib in rapid Japanese. We could see how he could make the mistake. The Caribs are darker than a caucasian, but lighter than an American Indian. The Caribs we saw at the little shops we stopped at, spoke English fluently - as well as Creole (when they spoke to Tony). They were friendly and seemed quite happy in their environment. However, as we drove through their towns, some of the Caribs did not look happy or friendly as we drove by. We went up into the mountains next, and stopped at the World Heritage Site called the Emerald Pool. 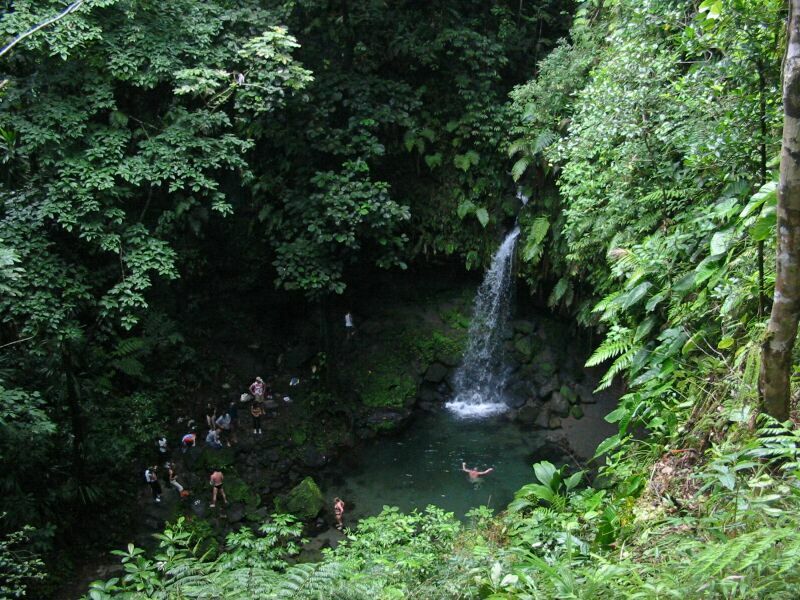 This is a national park site situated in a tropical forest with a waterfall which drops into a large rock pool. 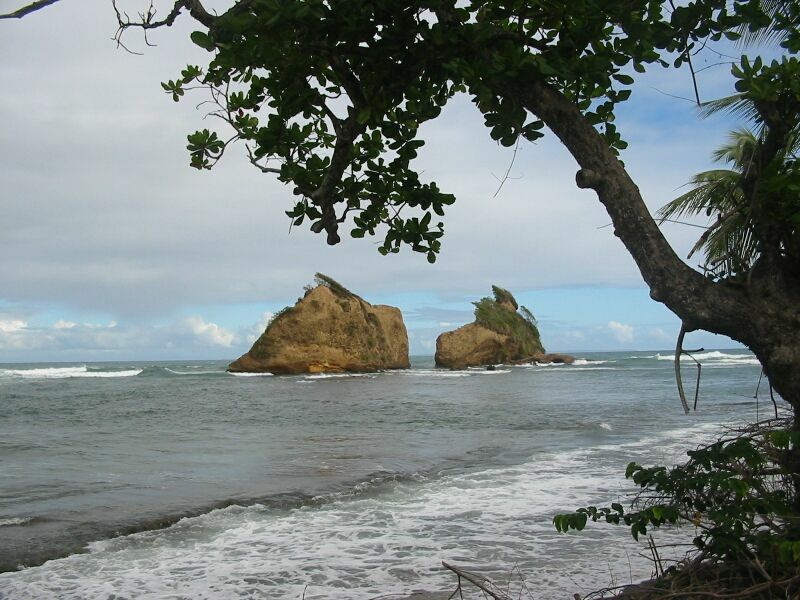 The site is frequently visited by tourists stopping on cruise ships in Dominica. We were fortunate there were only a few dozen other visitors while we made our visit. 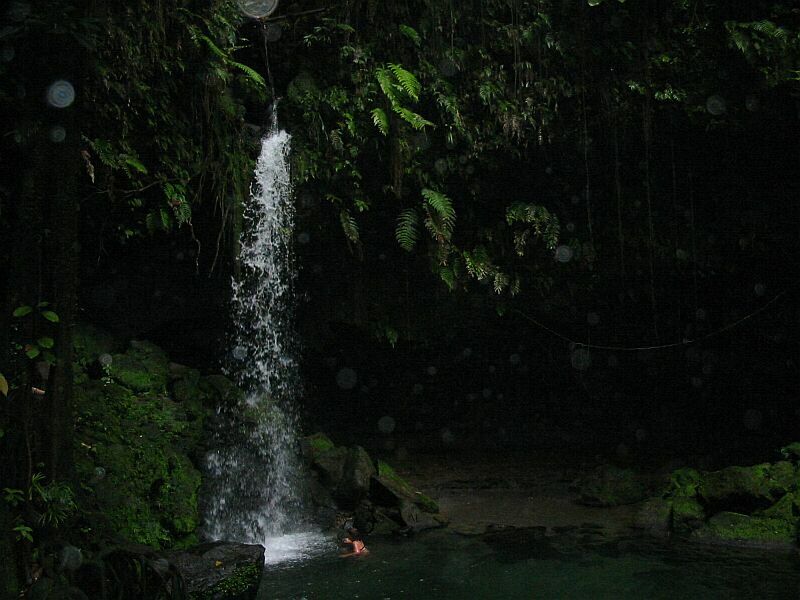 Frank and the girls took a swim in the pool and put their heads in the waterfall along with other visitors. Next, Tony drove us to a more populated area near Roseau - the capital - so we could find a decent restaurant for some lunch. We had a nice lunch of creole-style chicken and some local sodas. During lunch, after telling Tony about some of our adventures, Tony shared with us an interesting story. He said he had been to St. Maarten, and in fact spent a month in jail there. He and another friend had tried to smuggle illegal aliens into the country and got caught at night. He was given a three month jail-term, but convinced his jailers he needed medication from Dominica and they sent him home by plane after only a month. Yet another example of the lower ethical standards here. He didn't even seem to think it was much wrong, as he told this in front of our children, and was anxious to go back and visit St. Maarten. Tony then drove us along the west coast road all the way back to Portsmouth. He took us to the house of the oldest person in the world - Elizabeth Pampo Israel - now 130 years old! She lives in nice new, but quite small, house - built for her by the government. They put a plaque on her house saying she is a "National Treasure". Her electricity, water, food, and a caretaker are all provided by the government. We chose not to be the typical tourist and walk in to visit in her house. Next Tony took us to the new "Swim with Dolphins" location on the north side of Portsmouth. We met the American proprietor, who told us about the program. They are a branch of the Key Largo, Florida program we have read about and had just opened in December. We speculated later that this location was probably put here after the huge public outcry when they tried to open one of these in St. Lucia. There's a lot of opposition to these captive dolphin programs. We don't support it either, but we had to admit the dolphins appeared to be happy and healthy. Tony returned us to Alexis who took us back to our boats. Frank took extra care in locking up the boat, but during the night, discovered one of the two ropes holding the dinghy onto PatiCat was cut. The other rope had the 1/4 inch steel cable which was locked on the boat. This apparently stopped yet another attempted crime. Sigh. The next morning, we left first thing - not wanting to have anything to do with Portsmouth again. On the way from Portsmouth to Roseau - the capital of Dominica - we tried stopping a couple of miles off shore, near a point where sperm whales had been spotted recently. We had only waited 15 minutes when Catherine spotted the first sign of whale! Several times over the next hour, we spotted two sperm whale surface. A couple of times we even saw their tail flukes come completely out of the water as they dove down deeper. We also saw, through binoculars, their backs and heads as they broke surface. We caught some of the spouting with the video camera, but were never close enough to get close-ups. We waited another hour, but never saw them again. It was still a very exciting thing to be so close to these huge creatures. We had lunch while waiting for the whales and then sailed the rest of the way down to Roseau. About 3 miles out we were approached by a boat boy, but we told him we weren't sure where we were going yet. Then, another boat boy tried to pick up a mooring ball for us, but we realized it wasn't in front of the hotel we had read about - so we turned about. We eventually found a mooring ball in front of the Anchorage hotel and yet another boat boy - this one named Pancho - helped us moor there. Well, we had hoped the capital, Roseau, would be more upscale. But, although more populous, we found it was still is a sad state. The downtown area largely caters to locals for shopping, and for the cruise ship tourism. Everywhere we were approached by enterprising taxi drivers and souvenier sellers. We also got picked up by an enterprising "taxi" driver who offered us a ride to town for the same amount a bus would have cost us. We had our laundry done for a very reasonable price while we shopped in town. We found a very nice sandwhich shop with an Internet cafe and even a book swap on the second floor of a shopping building. They obviously had catered to other yacht cruisers from the book selection. This was probably the highlight of our visit in Roseau. We tried to do grocery shopping, but the selection and prices were not very good. We did get our usual souveniers purchased, and spent one day at the local market and bought a bunch of 15 bananas for about 40 cents US. We wished we had bought more. We had a day of home schooling, and then Frank attempted to change the oil. But, he discovered the electric pump we use to draw the oil was not working properly due to a broken impellor. So, we decided to leave the next day, on February 17th. Frank went to the Ferry Terminal after a ferry arrived on Sunday afternoon and got a clearance from customs. The next morning we left for Martinique.